Morning of my birth, my mother buried me in a hole that was two feet deep. Strong though she was, she was weak from my birth, and as she dug the wind filled the hole with leaves and the rain collapsed it with mud so that all was left was a wet and spindly bed… I opened my mouth wide to make a sound, but instead of air there was only fluid and as I gasped I felt my lungs fold in. In that first light of morning my body contorted and I saw my own fingers reaching up to her, desperate things. She held them and I felt them still and I felt them collapse. And then she said Shhh, shhh, my darling. And then she slit my throat. I should not have seen the sky turn pink or the day seep in. I should not have seen my mother’s pale arms sweep out and heap wet earth upon me or the white birds fan out over he head. A newborn baby as narrator rather does your head in if you think about it too much. In Courtney Collins’ hands, though, the baby-narrator can see all things, know all things, and be as one with the sky, the earth, the universe. It also frees the author for some beautiful, lyrical writing that would perhaps be too baroque and overwrought otherwise. The Burial is based on the true-life story of Elizabeth Jessie Hickman, a bushranger who ranged around the Wollemi area in the 1920s. A ‘wanted’ poster (which I assume is authentic??) for here can be seen here and a brief account of her life by her granddaughter can be found here. Both in fact and in this novel, Hickman was a circus performer, cattle rustler and rider. This post about the real life Jessie Hickman here mentions her marriage to the brutal Fitz, thus opening up the space for Collins’ story as Jessie escapes Fitz into the bush. She is pursued by many men, chasing her for many different reasons: her Aboriginal lover Jack Brown, the opium-addicted Sergeant Barlow, and the violent gun-happy posse of local farmers bent on revenge and punishment for the theft of their cattle. The feeling of them closing in on her drives the narrative, and it comes almost as a shock when the baby-voice narrator interposes itself again. Collins has many balls in the air here: the dead but all-seeing baby, the circus back-story, a somewhat superfluous story of a cattle-rustling gang that she joins with in the folds of the mountains, an encounter with a Chinese prostitute and a love story. While they were perhaps necessary to the knitting together of the plot, just the escape and the flight would have been enough for me. 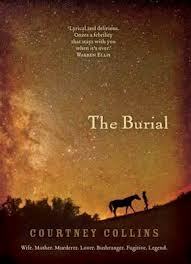 This book has been likened to Cormac McCarthy’s work (indeed, the frontcover is rather McCarthy-esque) and was eagerly anticipated after acclaim in its manuscript form. I can see the parallels with McCarthy, but what I liked in this book was the theme of thwarted maternity- both Jessie’s own and that of the few women she meets- and that’s something you don’t get in McCarthy, whose books explore masculinity so well. A rather petty quibble: I was irked by the author’s name on the top of each left-hand page. Whose decision was that, I wonder? Possibly not the author’s. It made me feel as if I were reading someone’s homework. This book was shortlisted for the Stella and the NSW Premier’s Award under the UTS Glenda Adams category for new writers. It has been optioned for a film, and I can certainly see how easily it would translate to the screen as it is already composed of a series of ‘shots’- a technique that I’m not particularly fond of and which betrays, I think, an author’s difficulty in wrangling the disparate elements of a story into a flowing narrative. And what about that baby as narrator? Well, I think that the gamble paid off. It liberates her to write lyrically and, given that I often only take a broad-sweep memory of a book with me, I think that it makes the book stand out. I’m not sure that she sustained it throughout- or even if I would have wanted her to have done so- but it was a brave move and one that this new author handled well. Read because: it was short-listed for the Stella and I want to use it as one of my Australian Women Writers Challenge reviews. 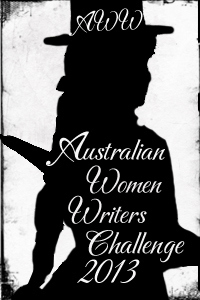 This entry was posted in Australian literature, Australian Women Writers Challenge 2013, Book reviews. Bookmark the permalink. Oh, I missed this when you posted it RJ — it was my father’s birthday and I was otherwise engaged. I loved the book, when I read it in the last month or so — I agree that she made that voice work. It’s a book I won’t forget in a hurry. I think the meeting with the cattle rustling gang is important to developing Jessie’s character – to seeing her softer (perhaps maternal side as you refer to later). It also provides a nice change of pace and an easing of tension for a little while, a bit like Shakespeare’s comic sections do in tragedy? I was going to say that I didn’t see the author’s name at the top of each page … and then I realised why. I read it on the Kindle! I agree that the rustling gang section did provide a change of pace, but I just felt as if it was a bit unnecessary. I don’t think that the book would have suffered from its omission, and I don’t think that it contributed enough to Jessie’s character to justify its inclusion. It felt a bit like padding to me.